Visit the Coalition for Responsible Gene Editing in Agriculture website. Gene editing is a technology that offers tremendous benefit to society through human health and food production improvements. The potential to solve a broad array of challenges, ability to make precise improvements, and the relative affordability of the technology has generated tremendous interest in developing gene editing. As more agricultural organizations and food companies explore gene editing, a question comes to mind. Do we, as food system leaders, have consumers’ permission to utilize gene editing technologies in food production? To address this question, CFI members and partners formed the Coalition for Responsible Gene Editing in Agriculture in 2016 to engage with consumers and stakeholders, working together to earn permission and trust around gene editing. Gene editing makes precise, intentional and beneficial changes in the genetic material of plants and animals used in food production, which can improve their health and sustainability. This often mirrors changes that could occur in nature or through traditional breeding. Gene editing helps farmers keep pace with the growing demand for more and better food, while using less water, land, nutrients and other resources. What is the role of the Coalition? The Coalition for Responsible Gene Editing in Agriculture strives for global understanding and acceptance of gene editing technology in agriculture and food. Coalition participants have a shared mission to earn trust in gene editing to help provide consumers with safe, nutritious and affordable food produced in sustainable systems. Agriculture and food system leaders feel it is imperative to openly and transparently communicate with stakeholders and consumers about the benefits and responsible use of gene editing as products are being researched and developed. The current workstreams of the Coalition are centered around creating a system-wide responsible use framework; developing communication best practices, toolkit and training; and implementing a stakeholder outreach campaign. In mid-2018, the Coalition established a multi-stakeholder steering committee to develop a framework for the responsible use of gene editing in agriculture, to provide assurance to the food system and consumers that those using gene editing within the framework are worthy of trust. The Coalition will encourage the widespread adoption of the responsible use framework by all entities utilizing gene editing technologies in agriculture. 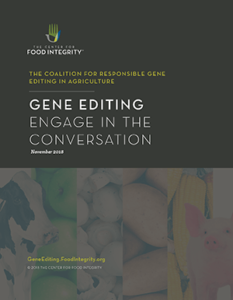 In fall 2018, the Coalition launched a communication resource focused on public perception and communication materials for those researching, developing and communicating about gene editing in food and agriculture. The Coalition’s Leadership and CFI staff are currently working to secure additional Coalition Leaders and Participants to initiate the next phase of stakeholder and consumer engagement. Over the years, CFI has found the most successful coalitions are those with leaders and participants that reflect the diversity of the food system. To learn more about how your organization may be an active Coalition Leader or Participant, contact Amy te Plate-Church.